Directions From M50. After village of Kilmacanogue continue Southbound for c. 2 miles when you will see signs for the Glenview Hotel on the left. Take the left which will lead you on to flyover then directly into the Glenview Hotel. Rooms were nice,curtains were frayed on our window but lovely views,we ate at the bar,lovely food....we had a beautiful breakfast,the outdoor hot tub was my favourite part,parking is safe and secure.hotel is situated in a good area for travelling wicklows must see areas.....happy allround experience for a 2 night stay. Really enjoyed my stay at the Glenview. This was my third visit and the rooms have been redecorated since I was last there. The hotel is beautiful, food is wonderful and staff are very attentive. The backdrop of the dining room and bar is so spectacular and scenic. 5 stars all round! While we enjoyed our stay in the hotel, I did suggest that the dinner menu could be varied more. The same main courses were on offer each night with one variation generally- usually the meat offer. The breakfast could have been kept hotter. We usually had breakfast about 9.30 and the "Full Irish" wasn't hot enough. The bedroom was very nice! Stayed here for 3 nights during the week. Had a great stay and felt the value for money was excellent. The place was very clean, lovely fires lit during eh day, very relaxed atmosphere and rooms were spacious. The room facilities were excellent. We ate in the restaurant all 3 nights and the food was faultless. Presented very well and very tasty. All staff in the restaurant where very helpful and friendly. The breakfast was good also but i felt there could have been more healthy options e.g granola, selection of yoghurts, seeds etc. The view at breakfast was amazing. We also used the leisure facilities - the gym equipment was a little outdated and the pool was very busy/noisy in the evening time. After breakfast was ok though. I was also a little annoyed to see the hot tub to have a sign saying 'cold' on it. We went for lovely walk through the gardens which was lovely also and the location was great. Enjoyed our night in the Glenview Hotel. Receptionist very pleasant and welcoming. Had a very tasty meal in the bar. Room very comfortable. Would stay there again. I stayed here with my wife. Our impression as we stayed for a few nights was that here is that its lacking Investment, Management and Supervision., Standards for a 4 star have slipped. Food that was on the menu wasn't available for two nights. (Duck and Lamb) Some tables weren't wiped and empty glasses were not removed from some of the dining tables or the drawing room. The mirror in the bathroom had toilet paper wedged in between the lower frame and tiles and the furniture is tired and worn and in some areas needs replacing. Some guests we spoke to complained of having no water in their room and we had no coffee capsules replaced for our coffee machine. Some guests that stayed here were questioned why they hadn't booked a table for dinner. Seriously? Outside the trees that obscure the beautiful views could be topped. The roof in the swimming pools needs replacing and there was no Hot Tub available. I found a disposable razor beside the jacuzzi and kids were playing near this. There was no ventilation in the rooms and windows had to be kept opened. There are maintenance issues galore in your beautiful hotel but its lack proper Supervision and Management. I wish you well into the future. We had a lovely 1 night stay here and while the service was good, the views were good and the hotel was good, the meal we had on Sunday night in the restaurant was one of the best meals we have ever eaten anywhere in the world. I asked the waitress what nationality the Chef was because we were so impressed with the food. Well done to all the kitchen staff for our 5 star food. Nice hotel in a lovely setting. Staff nice and helpful with any queries we had. Breakfast had a good selection of food and everything was piping hot. Enjoyed the pool too. Would return again. I particularly liked the cat in the porch. My wife and I stayed at the Glenview Hotel for one night B & B plus evening meal conmencing on Friday Jan 29 2016. Excellent food and accommodation. Staff very friendly and helpful. Highly recommended. Pleasant experience. Staff was very friendly and helpful. Room was very neat and kept to high standard. Breakfast was very good. My sister and I really enjoyed our 1 night stay in the Glenview on Sunday 29 November, 2015. The staff were very friendly and helpful, the room was very comfortable and well equipped. The food, both for dinner and breakfast was delicious. We loved the cosy feeling of the place, the setting is beautiful and the cat is a BIG attraction. It's a great place to just chill out and as my sister is suffering from cancer at the moment, it was particularly relaxing for her. We hope to be back soon. We stayed in the Glenview for one night and after an unfortunate incident with the shower head in our room we were immediately and with absolutely no fuss moved in to the Presidential Suite. The suite was gorgeous, extremely spacious and the bathroom was fabulous. The food in the Conservatory Bar was lovely and the prices very reasonable. We found all the staff to be very helpful and friendly and I would have no hesitation in staying again. Enjoyed our recent stay very much, very comfortable room, good food and and lovely location. the dining room very 'nice' lovely views from the panoramic windows. Fantastic hotel. Staff are excellent and make you feel so welcome and looked after. Comfortable rooms, plenty of choice for food and drinks in a relaxing environment. Love this place - would highly recommend! Stayed 3 nights this week - very enjoyable time. Beautiful location and stunning views from room and dining-room. Staff were all really lovely, helpful and attentive without being pushy! Such a "Chill-Out" location both inside and in the beautiful grounds - a total oasis of calm! Location so accessible to Dublin, all of Wicklow and great places close by. 10 out of 10 all round! Exceptionally friendly staff. Fantastic location. Quality of food is first rate. Well equipped leisure centre. Best value for money. An excellent hotel with excrllent service & food. Couldn't do enough for the patrons. 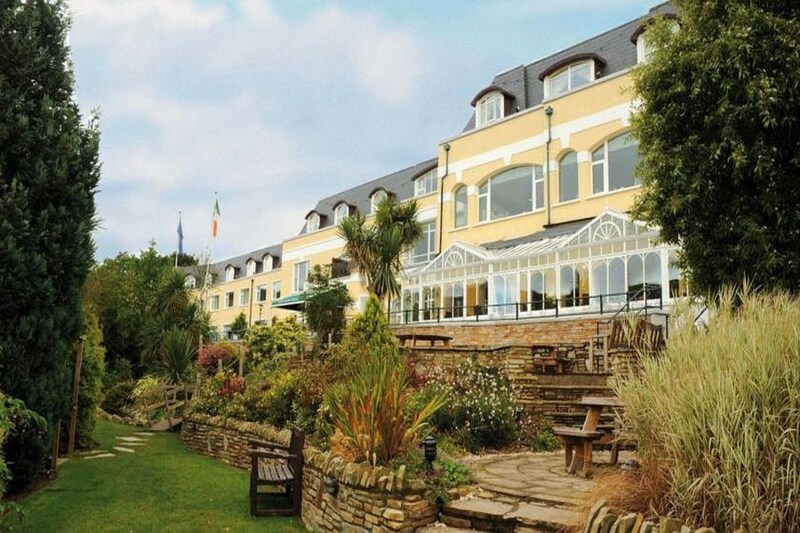 I stayed in the Glenview Hotel on Friday 16th May with five friends. We thoroughly enjoyed our stay from the moment we arrived to the moment we departed. We ate in the fabulous restaurant with stunning views, brilliant menu and wonderful helpful service. We also had our breakfast in this wonderful room with stunning views. Overall it was a lovely stay and we will be returning soon. A big thank you to all the staff at Glenview. great stay, staff were perfect, huge bedrooms with great view of the glen as requested room 204 magical. food great . it had it all the . the hot tub ended a perfect day. a really amazing good value stay, recommend to anyone. Staff were excellent and very present. Very good location and nice relaxing atmosphere. The staff couldn't have done more for us - Very friendly and helpful. The rooms (we booked 3) were spotless, well maintained had everything including safes, Ironing facilities and Tea / Coffee. All our meals were piping hot, well presented and excellent. The view is stunning and drinks very reasonably priced. We wanted for nothing and thoroughly enjoyed our weekend away with our neighbours. Well done to all at the Glenview. ten out of ten. The room we stayed in was large and comfortable. The staff were helpful. 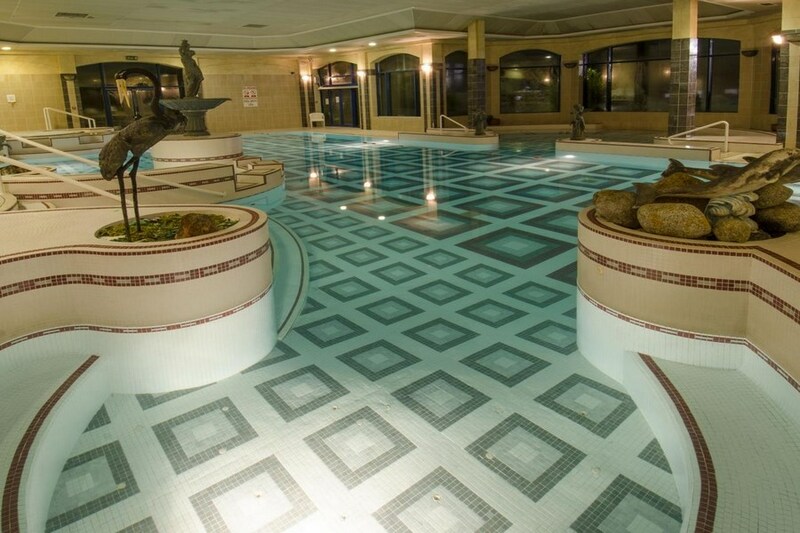 There is a pool, sauna, steamroom and jacuzi which were all good amenities. The gardens on the grounds are beautiful. We had dinner in the dining area near the bar. The food here was fairly nice, but nowhere near as good as it is in their restaurant upstairs, (where we dined a few months ago) which wasn't open the night we stayed. Overall, it is a good location to stay. Had a great time .Room spotless a little old fashioned, staff brilliant,Dinner could have been better a little expensive for what you were given far to small.Entertainment excellent, hope to return. Loved this hotel. Stayed here for a night last weekend and couldn't fault it. Staff are so friendly , in fact they are the nicest staff I've came across in a hotel yet. Pool is fab! Dinner was incredible, the portion sizes are huge!! Just love the hotel will defo be back, cant recommend the hotel high enough!! Had a great weekend here. Lovely hotel, perfect for families. wonderful, restful stay, great food and service. Review by Lorraine on 22.02.2014 Lovely hotel in very scenic setting. Very friendly and efficient staff. Our room was very clean and with very comfortable beds for a great nights sleep. We eat in the Woodlands restaurant and the food was well presented, and the service was good. There was also a good selection of choices of foods for breakfast the following morning. The pool facilities were very good with steam-room, sauna and outdoor hot tub. There is a lovely wood land walk outside the surrounds of the hotel, which takes in some lovely gardens. This hotel is also very child friendly for families. I will definitely return for a repeat visit, some time in the near future. Felt totally relaxed and pampered,looking forward to visiting again. I recently spent a two day break with my mum at the Glenview hotel. My Mum was very impressed with the size of the room. Service and food was very good.. My only regret is I should have taken a longer break. I would stay here again. Kids really enjoyed the pool and breakfast. Great family break! Nice hotel and lovely helpful staff. We had dinner in the restaurant which was very good except for the desserts, they were very disappointing. It's not the best breakfast I've ever eaten either. We really enjoyed our stay, food was great, and staff very good. Reallly comfortable beds. Very good value. lovely hotel, food is great but won't be going back. we left are room early that morning, because are room was freezing. my boyfriend and i both woke at different times of the night thinking are window was open. we had the blanket out of the wardrobe, and i went out to the car to get a heavy jumper to sleep in. we were looking forward to going for a swim the following morning, but the thought of been cold for another minute made me feel sick. 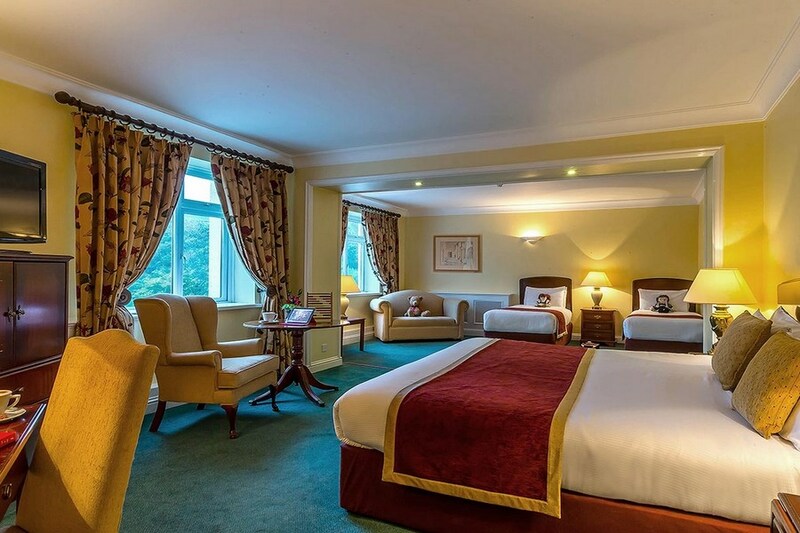 Excellant hotel in a beautiful location very close to dublin city centre avoca wicklow.. Staff were very friendly and extremely helpful. Food was really good well prepared and served in a lovely setting. Beautiful Hotel, food was excellent, service was excellent, we both had a great time. Highly recommended if your looking for nice break. Would certainly return. Top class and extremely good value for money!